With over 40 per cent of the federal government's 1.6 million employees retiring over the next 10 years, now is the time for anyone seeking a government job to take advantage of the massive retirement wave that has already begun. Yet until now, no truly up-to-date or comprehensive book has existed to give readers the tools and guidance they need to get hired for a government job, internship, or fellowship. Entertainingly written by a successful career coach who has climbed the federal career ladder herself as a hiring manager, this reader-friendly book steers prospective applicants through every stage of their job search. This book draws on interviews with more than 100 other hiring managers. 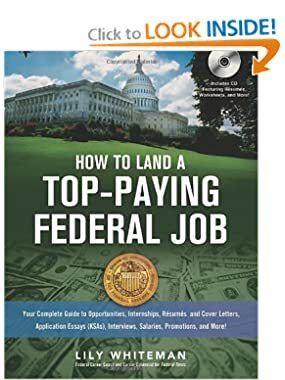 Including a companion CD filled with sample resumes and worksheets, this is the book to have when seeking out employment with the federal government. I got in touch with Lily when I was negotiating a federal job. My knowledge of how things worked with federal jobs was pretty limited. I had already been offered the position but didn't know what was and what was not negotiable. Lily was tremendously helpful. She outlined for me what was negotiable (and what was not) and potential rationale for why I should get the things I wanted (step - which translates into salary, vacation time, student loan repayment, relocation expenses, etc). She knew far more than the human resource people who I was negotiating with. For example, I asked that the feds pay back some of my student loans. The HR person said that they did not have the authority. I stated the details of the law congress passed to give them the authority (which Lily provided to me). It took them a couple of weeks to come back and explain that they didn't know they had that authority, but based on the law and my rational they agreed to repay part of my student loans. I was able to successfully negotiate every other aspect that was important to me, with great gratitude to Lily. I have no doubt that without Lily I would have either been unable to accept the position or would have accepted it with far lower pay, less vacation time, and less coverage of student loans and moving expenses. I was told by our HR people (once I started the job and got to know them through hiring other people) that I was the toughest negotiator they had encountered. I didn't ask for help from Lily in getting the job as I already had an offer when I contacted her, however I'm confident that her knowledge would apply to getting the job as well. The federal system is complex and difficult to navigate.